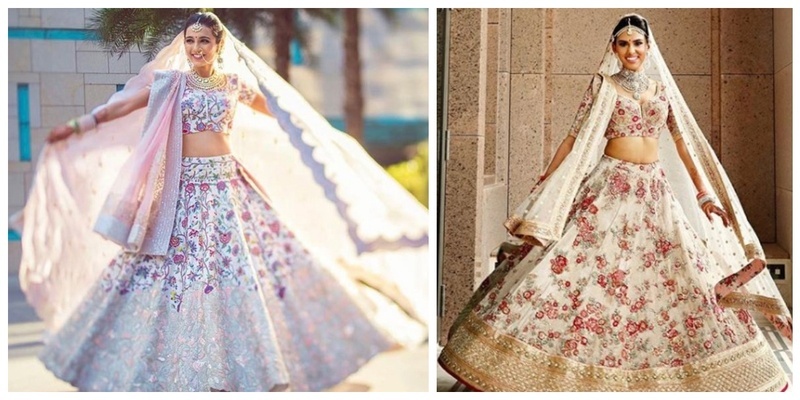 25 bridal lehengas with floral prints & embroidery that stole our hearts! Florals have always been a preferred choice for brides for their wedding trousseau because of the grace and beauty that they add to it. I mean aren't they just perfect? Whether you opt for classy or bold, subtle or glamorous, florals can easily be adapted into any preference. What better example can possibly be given when the star wedding of this year featured Anushka Sharma wearing one of the most beautiful floral printed bridal lehenga on her D-day! She looked resplendent in a pale pink Sabyasachi lehenga with Renaissance embroidery in vintage English colours embellished with silver-gold metal thread, pearls and beads. Shweta Tripathi, who recently got hitched in a beautiful destination wedding in Goa, looked her radiant self in a fuschia pink pink lehenga skirt paired with a floral choli and a sheer mint green dupatta by Papa Don’t Preach! We spotted a bunch of pretty pink lehengas, and this one is one of my favourites. This minimalistic silk lehenga with light floral embroidery over it is complemented perfectly by the groom’s floral printed off-white sherwani. Relatively lightweight, this chiffon lehenga is perfect for brides who believe in keeping comfort as their priority. Loved the broad floral border and floral printed complementing chiffon dupatta of this alluring sea-green lehenga. 5. Vibrant floral printed red-beige lehenga! This beautiful red-beige lehenga of this bubbly bride just had me staring for quite a few minutes. The pop-out pastel pink and red floral embroidery adds a special charm to this lehenga. It is finished with beautiful broad golden border on the edges. This bride's love for pastel pink can be seen from this soothing rose floral print lehenga. The pop out embroidery of roses is what that had me glued to this pretty bride's picture for quite a time. 7. Rubina Dilaik’s lovely ivory lehenga! This wedding seems like a yesterday's affair cause it's just so difficult to get over the gorgeous wedding ceremony of Rubina Dilaik. She looked like an absolute princess in her ivory lehenga with pastel pink, silver and golden thread floral embroidery all over it. She complimented her trousseau perfectly with offbeat choker set and layered necklace jewellery. 8. Subtle multi-coloured floral embroidery lehenga for this blogger bride! This blogger opted for a subtle off-white lehenga with multicoloured floral embroidery all over it. Paired with minimal traditional golden jewellery, this outfit definitely stole our hearts. 9. Off-white silk lehenga with minimal floral embroidery over it! This subtle silk lehenga’s beauty is simply beyond words. The sleek golden and red border on the edge of it along with its light floral embroidery is what that made this lehenga, minimalism in perfection. 10. Lovely turquoise lehenga for this minimalistic bride! Stunned by the beauty of this turquoise lehenga, and utterly happy to see such a cheerful bride. The all over golden thread embroidery of this bangalori silk lehenga is too pretty to look at. It's classy, it's graceful and it's one of a kind. 11. Bright pink lehenga for this gorgeous looking bride! Another exquisite example of a vibrant pink lehenga. It has golden thread floral embroidery all over it with silver threads giving it a glittery finish. 12. Floral print and brocade embroidery lehenga for this twirly bride! Beautiful as it is, this half and half embroidered lehenga is giving us major offbeat trousseau goals. Loved how the vibrant print on the top falls into a beautiful brocade embroidery. Manish Malhotra who is perceived as the king of glamorous outfits, created this beautiful outfit which is simply gorgeous to look at. Ivory Floral embroidery with heavy embellishments over it make this lehenga drop dead gorgeous. 14. Cute blingy net lehenga for this alluring bride. Ever seen a bridal trousseau so elegant and pretty yet utterly light and comfortable? This net based pale green and yellow lehenga has patch work floral embroidery and added to it is a subtly created charm of bling. Loved the intricate pattern over the blouse and the complementary dual coloured net dupatta. 15. Perfect red and white combination lehenga for this bubbly bride! This lehenga is the perfect example of how to play with colours in the most alluring way. A perfect combination of red and white mixed together for a beautiful bridal trousseau. And added to it, are the two complementary coloured dual dupattas completing the bridal look in perfection. 16. Pretty peach lehenga for this bride with a pretty smile! Words cannot perfectly describe the beauty of this marvellous peach lehenga. With light floral golden thread embroidery all over it, this lehenga looked like an absolute aww-gazed affair. 17. Gorgeous off-white lehenga for a funky bride like this! Look at this pretty bride giving a funky pose with her cute shaggy dog. Her wedding trousseau was as gorgeous as her quirky pose. With an off-white base with patch golden thread embroidery and complementary net dupatta made in an apt choice for an offbeat bridal lehenga. This oh-so-pretty bride chose an amazing Banarasi silk lehenga with pretty lotus prints all over it. Her offbeat choice wasn’t just limited to her pretty choice of lehenga but her jewellery was an exotic one as well. She paired the lehenga with alluring temple jewellery and won hearts with her gorgeous bridal look. 19. Red florals on white lehenga for this picture perfect bride! Again a very simple yet subtle bridal lehenga flaunted beautifully by this pretty bride. The gorgeous white lehenga is filled with red florals and on the base it features a broad golden gota embroidery. Look at her beautiful twirl. 20. Subtle pastel pink and silver floral lehenga to rule hearts! A wildly popular colour combination of pastel pink and silver is what that is showcased in this bride’s wedding lehenga. Silver thread embroidery all over it and a broad intricate border at the bottom is the reason why this colour combination is always seen making headlines! 21. ‘Dil Guldastan’ lehenga from the house of Sabyasachi! Words are not needed to describe the beauty of this 'Dil Guldastan’ lehenga, coming from the latest bridal collection of Sabyasachi named 'kesaribai pannalal’. The lehenga is intricately embroidered on Bordeaux silk with hand-dyed velvet appliques, silk-floss, beaten silver and gold thread and rose-tinted crystals and rhinestones. The look is accessorized with jewellery from the Sabyasachi Heritage Jewelry Collection and romanticized with a sheer, diaphanous, embroidered veil completing the look of a traditional Indian bride! I know this one is not a real bride but I bet we would definitely be seeing a Dil Guldastan Sabyasachi bride in the near coming weddings!! 22. Gorgeous ivory lehenga with subtle ivory embroidery! Since ivory falls in my list of favourite colours, so I am keeping this lehenga as well in the list of my personal favourites. With bottom to top subtle floral embroidery and light stonework over it, makes it absolutely perfect for a 21st century bride. 23. Elegance at its best- Maroon velvet lehenga from the House of Sabyasachi! This elegant lehenga coming from the house of elegance of Sabyasachi does not need any words for appraisals. This deep red velvet lehenga has periodic floral embroidery all over the lehenga and towards the border it has a gorgeous golden thread embroidery finishing the look. 24. Peach lehenga with vibrant florals adding grace to it! This bride ruled hearts at her wedding with this charismatic pastel pink lehenga with vibrant floral patch-work embroidery all over it. The net dupatta with border floral work is perfectly complementing this oh-so-pretty lehenga! This beautiful velvet lehenga is simply too alluring to look at. The golden and silver thread embroidery of a beautiful pine cone crafted into flower like structure gives the lehenga its royal grace. So, I hope you concluded some amazing ideas for your bridal trousseau. Happy shopping, ladies!